You can’t go to Portland without stopping at Voodoo Doughnuts right outside of Chinatown. Your friends will have told you about the crazy flavors, and you will have smelled a distinct doughnuty aroma from the Waterfront Park by the river. 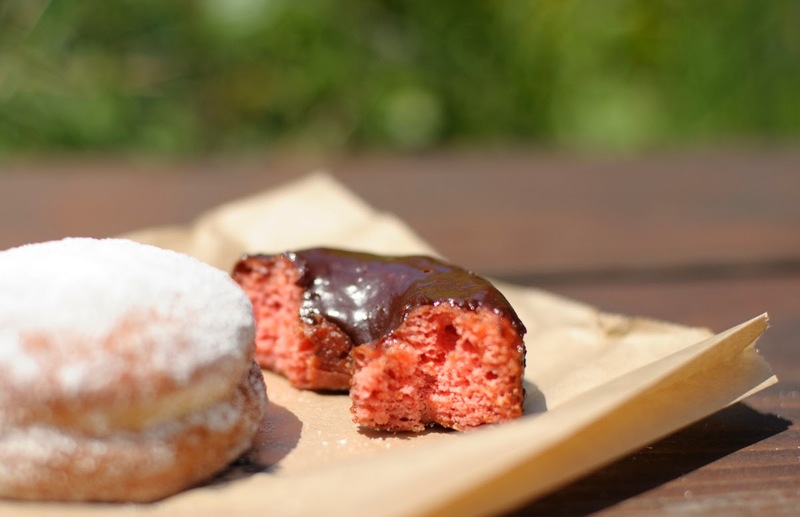 As a doughnut enthusiast, Voodoo naturally made it to my list of things to eat in Portland. But it wasn’t until towards the end of the trip that we made it over. This plus the chalkboard menu of flavors made for quite overwhelming decision-making. Luckily, we had some time to mull over the choices and take a look at the options, since we did not arrive to a line hugging the side of the building, like you’d typically see on a weekend afternoon. We walked away with the iconic large pink box, and three doughnuts: Caramel Delight (West coast’s version of a Samoa), maple-glazed old fashion, and a mango tango filled doughnut. Voodoo does not claim artisanally made doughnuts, and neither do their prices. We left with only $5 less than we entered with. I’m glad we did eventually make the trip over. We didn’t exactly go crazy with the flavors, as we could have opted for “Arnold Palmer”, “dirty snowball”, or “butterfingering”. This is likely in part because we couldn’t decipher many of the flavors from the names alone. The doughnuts we did try were very sweet, too much for even my sweet tooth. But my favorite was the Caramel Delight with its crunchy coconut exterior and soft cake interior. Visiting Voodoo is definitely an experience, and one worth having. But the doughnuts, however famous and wacky, are not on my top 5 list. 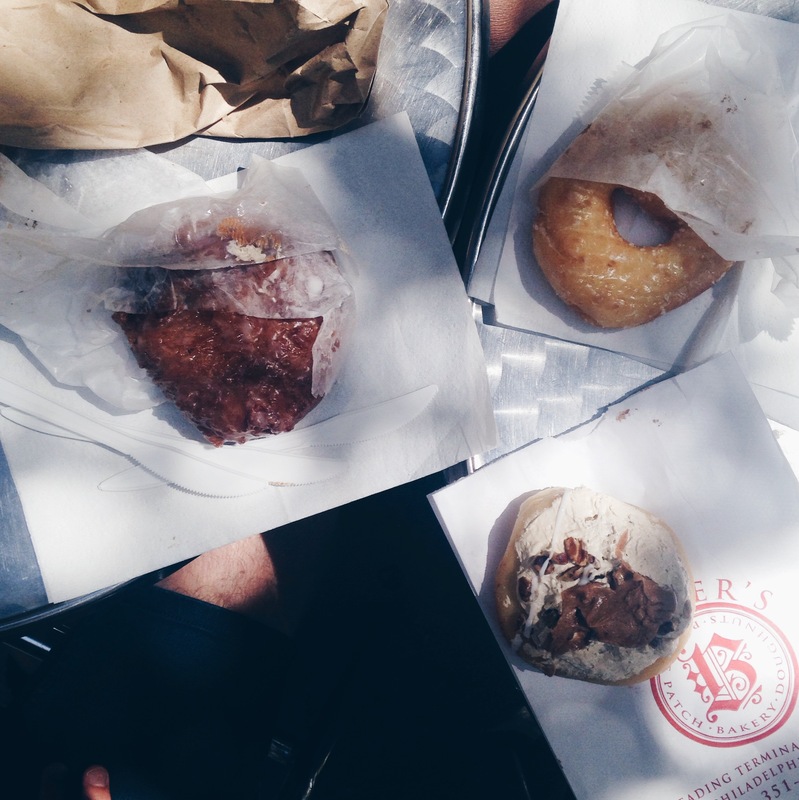 Stay tuned for a few more Portland spots you’ll want to check out on your next trip over! Read on for a thorough examination of the coolest, cleanest doughnut joint I’ve ever stepped foot in. Upon our arrival in Portland, my mom and I knew we had to locate a Blue Star Donuts. There are a handful of locations around the city, one in LA and one in Tokyo. The one we went to near the Pearl district had warm sunlight flooding in from the tall windows covering half the shop, and the steady drumming of the XL stand mixer kneading away. When we arrived around 10am, the line was not quite out the door yet, but we still had some time to decide on the doughnut varieties displayed behind glass next to the register before we had to order. 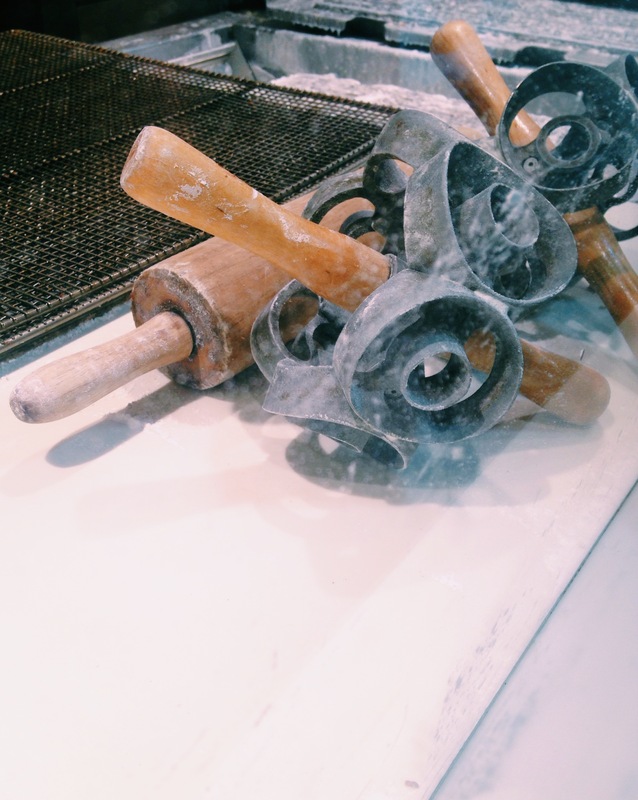 While we waited for our box to be assembled, I wandered the modestly sized operation, and I noticed a baker prepping a fresh mound of dough next to the coffee corner. When I asked him if I could take his picture, he said yes, and was very appreciative of my asking (I guessed he’s ended up on lots of people’s instagram feeds without consent). Less than three minutes after ordering, our box was ready. Torched top, vanilla bean cream center, and orange liqueur poking out, ready for incorporation via pinching. 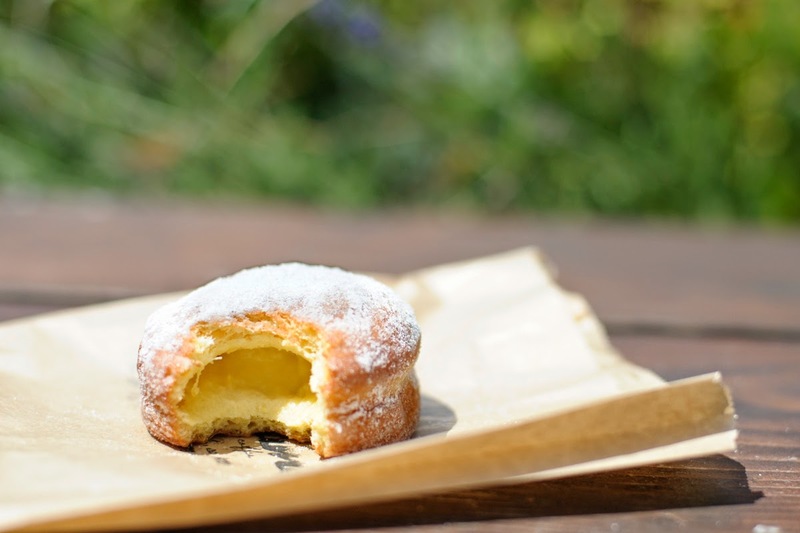 It was quite fun to bite into the crusty sweet top and land in a pillow of cream, all transported by soft and fresh brioche dough. This one’s a winner! Fritters are usually more dense than doughnuts since they’re typically made of the doughnut scraps and packed together once the rising in the dough has already occurred. These fritters are combined with an apple compote-looking mix, as shown in the second photo, further up. The outside was sweet and crispy, and the inside was very moist and apple-y. However, I think the density was too much for my mom’s and my stomach. We also couldn’t taste the hard cider (perhaps it got completely cooked off). Not bad, but not their best. This doughnut was actually featured on one of the three covers of Bon Appétit’s May Travel Issue – for good reason. This doughnut didn’t need any filling with the icing it came with. One bite and I got one big mouthful of summertime markets with the basil notes heading this train of flavor. The arresting blueberry burst came quickly after, and the combination was delightfully refreshing (but again, no alcohol). Plus, the crack of the icing when closing in is a great textural addition. The Valrhona Chocolate Crunch was super fun to eat. It had the same filling as the crème brûlée doughnut, and the top was covered in fancy deep dark chocolate and pearls of chocolate covered rice crispies. 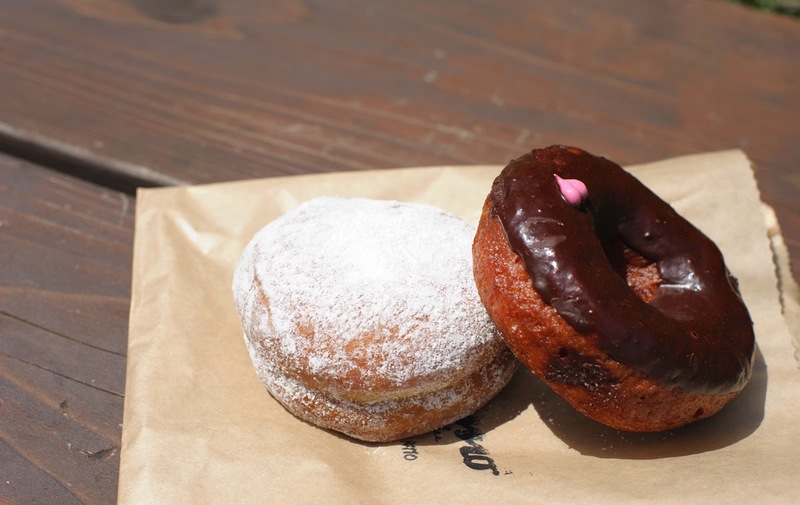 The chocolate ganache and almond doughnut was similar to the chocolate crunch doughnut, but without the filling, and with the crunch coming form the crushed almonds. Not too shabby. When we got around to the Meyer Lemon & Key Lime Curd doughnut, it seemed a little ordinary in comparison to all the others, but I’m always happy with lemon in my sweets, and it was enjoyable. 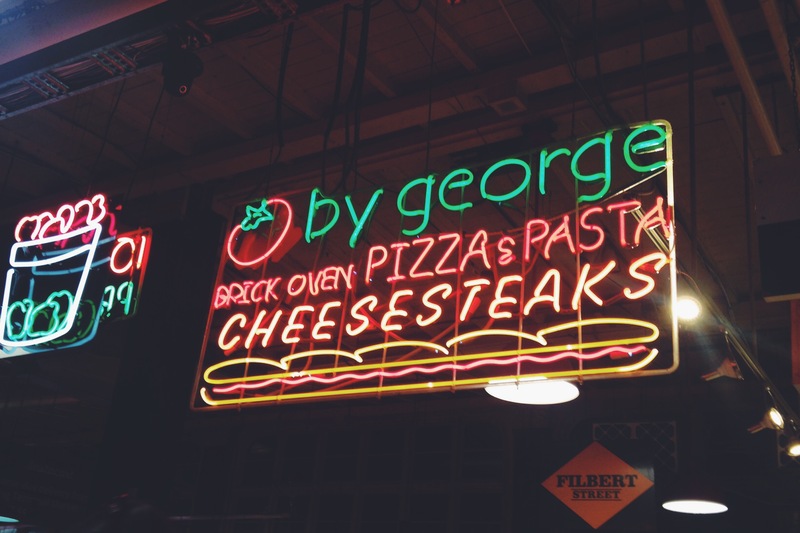 I spent around 24 hours this weekend in Philadelphia with friends, so naturally we set our priorities to finding the good food. 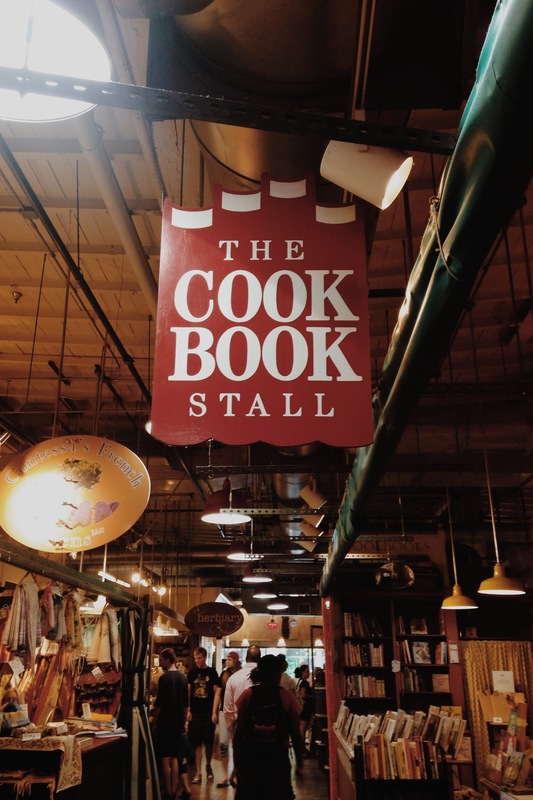 Being new to the city, I was looking forward to discovering the Reading Terminal Market – and discover we did! Compared to Chelsea Market, this indoor food plaza of beauty is a little harder to maneuver, but much more sensory-stimulating. 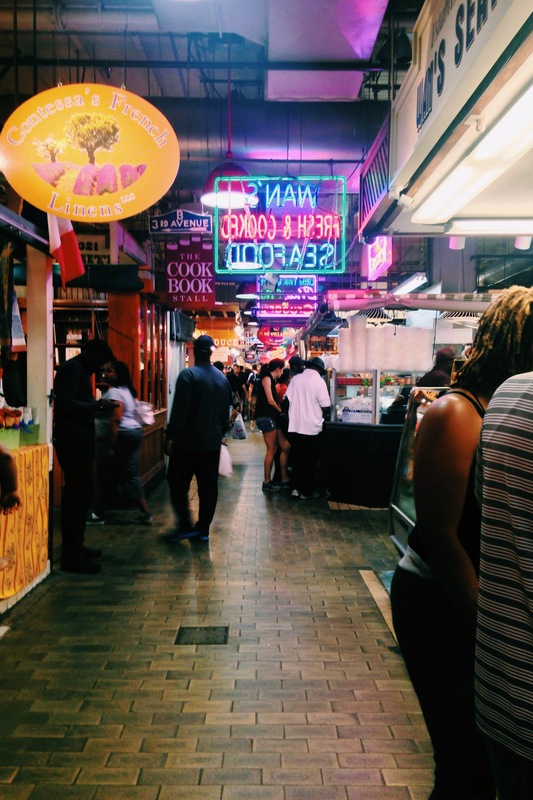 Bright neon signs, the scents of famous cookies, cold ice cream, Thai, Mediterranean, Chinese, Italian foods and more pack the building with sights and smells that will easily overwhelm you if you suffer from indecision. It probably took us 20-30 minutes to peruse and figure out what we wanted to eat. It was well worth the long stroll, and I now know what will be on my list the next time I’m in Philly (Famous 4th St Cookies? Kamal’s Middle Eastern Specialties? Profi’s Creperie??). 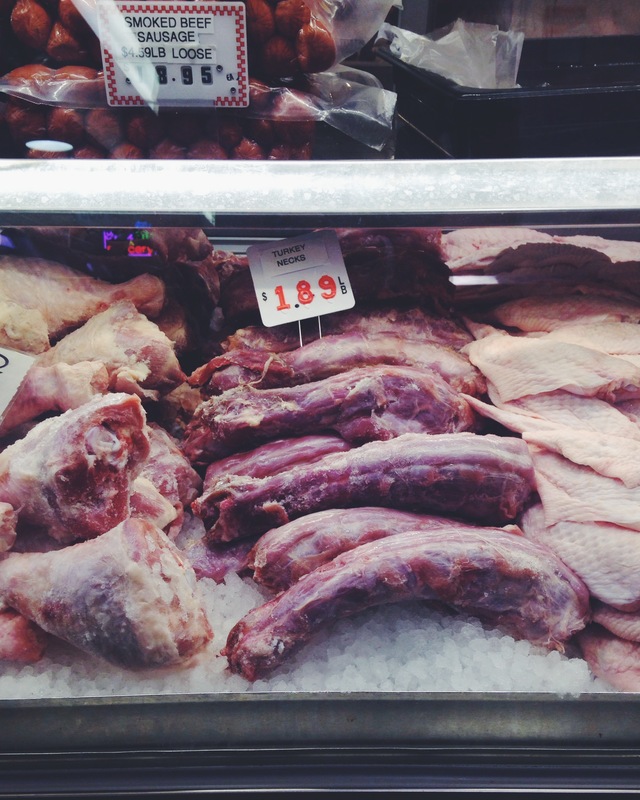 There is all sorts of stuff at the Reading Terminal market. You got your hot meals, your sweet treats, your groceries, and your books, flower essences, and juices. You could get a lot done here during the week (emphasis on “during” and “week”); like a street of Manhattan or Brooklyn, but reasonably priced. Turn your head one way and there are new and old cookbooks; turn your head the other way and there are turkey parts, all waiting to be purchased. What do you have for lunch in a place with more than thirty options? 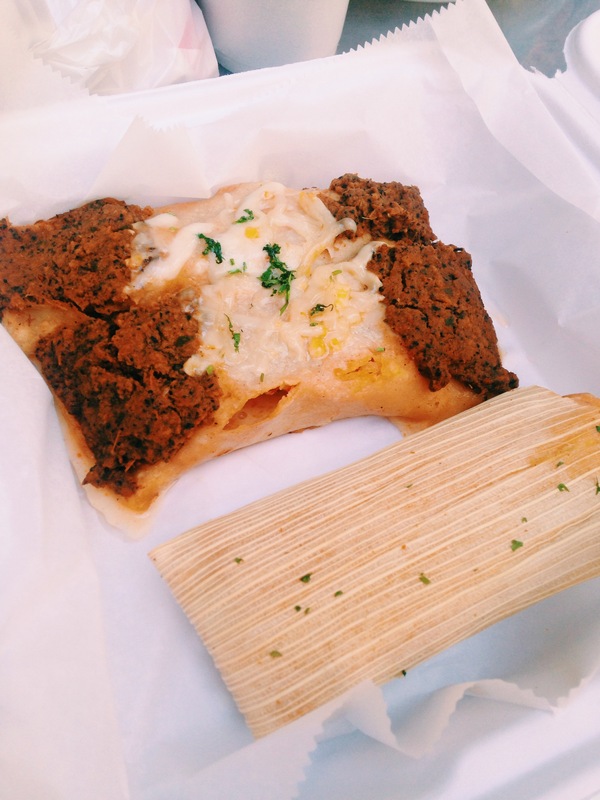 You go local: what’s the city specialty? In this case, I concluded a classic Philly Cheesecake was as good choice. This was split along with chicken enchiladas and a tamale for maximum tasting efficiency. 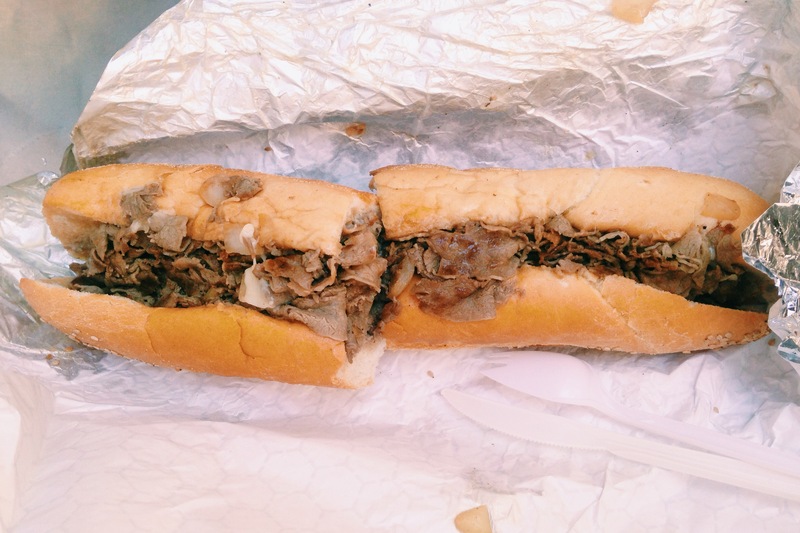 As you can see, the cheesesteak was much meat and min…anything else. There was definitely provolone in there. I’m sure it was fine for a cheesesteak, and I know next time to get some roasted peppers in there too. The enchiladas and tamale were quite satisfying. And of course after such a well-balanced meal, we went in search of dessert! “Great, thanks so much–” – and I make a beeline for Beiler’s. Luckily the wait does go quickly, particularly when you get to see this in front of you…check it out! Exhibit A: filling being scooped from vat into funnel. Check out that equipment! 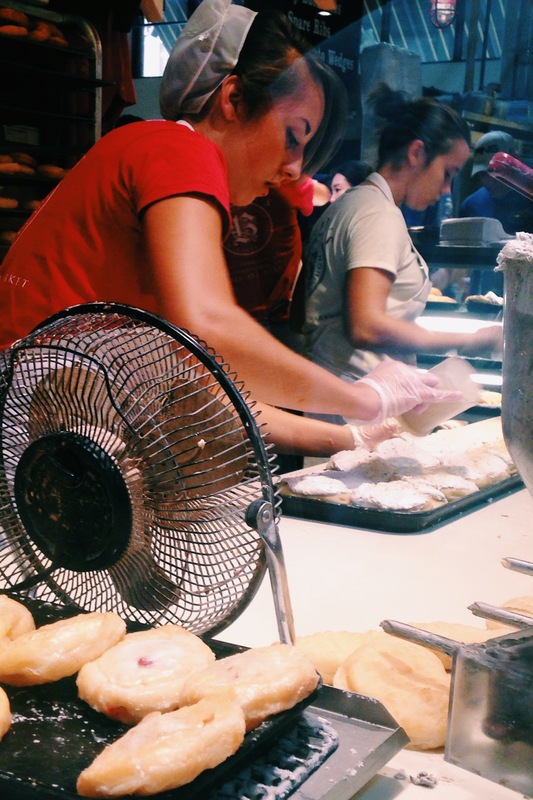 Doughnut cutting efficiency at its coolest. Some on deck to the fryer, others to be served. 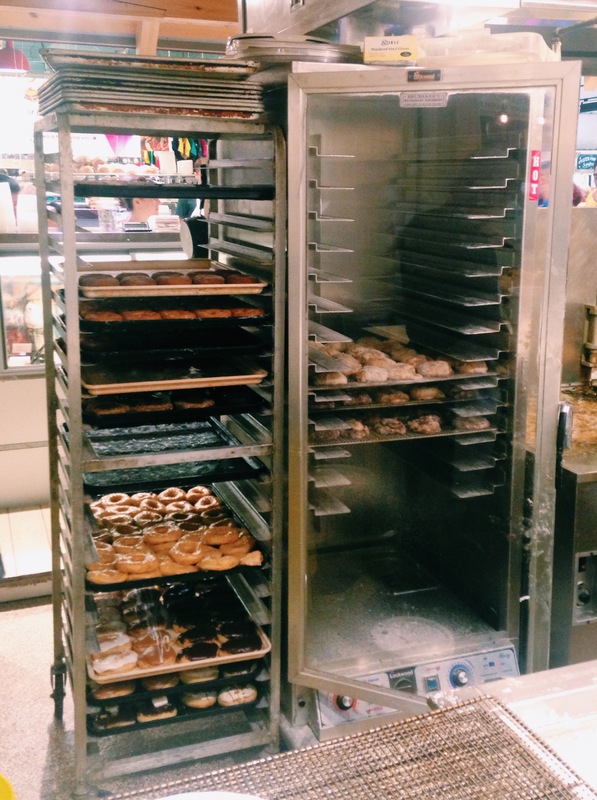 The bottom rack on the right side is full of apple fritters to-be-fried. They were flying out of the display case! Check out (part of) that production line. So those apple fritters; they were indeed flying off the trays they were sitting on behind the window, and people were waiting even longer for fresh ones to come out! They probably had two new batches sell out while we waited in line. We thought we’d try our luck and see if we could snag one by the time we made it to the front. As we paid, the newest batch was getting glazed, and our server went to grab one for us !!! What an experience. The steam was still coming off and it was almost too hot to eat. But, you know, we managed. Of course, we needed to sample some true/varied doughnuts to get a well-rounded feel for their game. Always get a glazed – that’s where all the magic should happen. You know someone can make a doughnut when their glazed is great. That was the most surprising thing about Beiler’s: this glazed doughnut was the best doughnut I’ve had, ever! Far exceeding anything Krispy Kreme could do for you, even right off the belt. This melted instantly in my mouth, was so fluffy, crispy on the outside, and light on the inside. I was shocked and highly pleased. The other one was maple walnut, and it was pretty good. A lot of frosting going on that was unnecessary, especially with the same on the inside. Good flavors, though. And the last kicker is the price of all of these: 95 cents!!! Suddenly feel like moving out of my own city…sigh to the #3dollardoughnuts. All in all, great time at the market, and great time in Philly. To round out the trip, we of course got brunch, from the Gold Standard Cafe in West Philly. 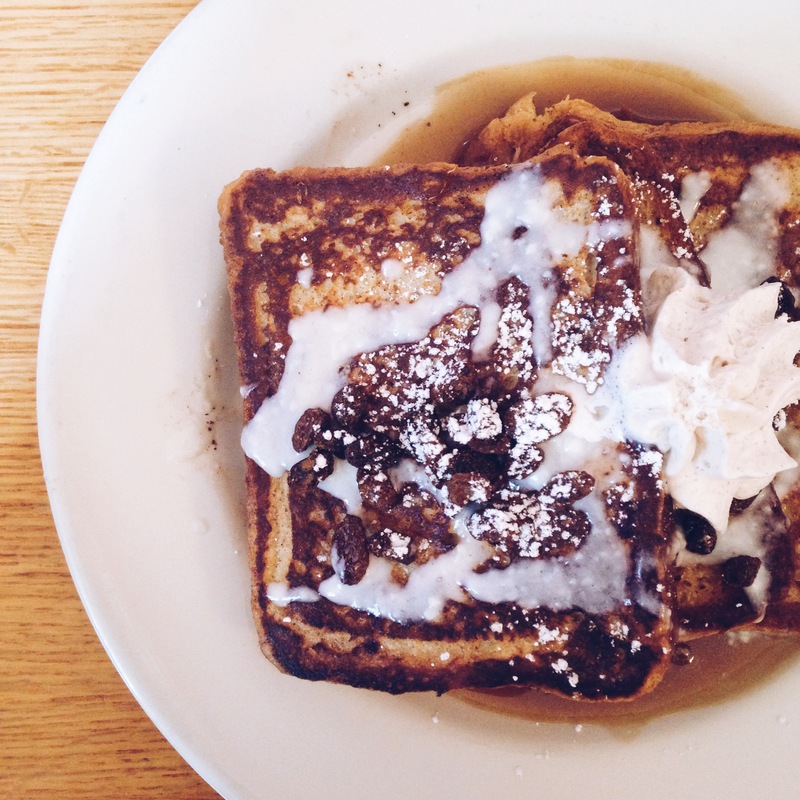 Cinnamon cream cheese French toast? Had to. Counting down the days till my next trip! 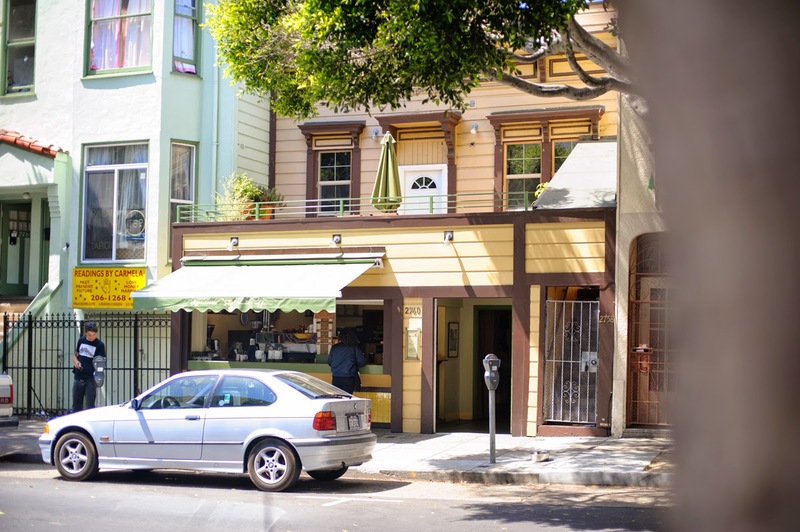 Ramadan has officially commenced around the world, so it’s a good thing I ran around the SF food scene early in the game. But don’t think a month of daylight fasting will deter me from the restaurant tables; I’m already making plans to visit Candybar Dessert Lounge *rubs hands*. I guess I like doughnuts; enough to find the best of the best in town according to Google. That’s probably one of a handful of things I got from my Uncle Banji – shout out for sacrificing the trans-fat-full Krispy Kremes. 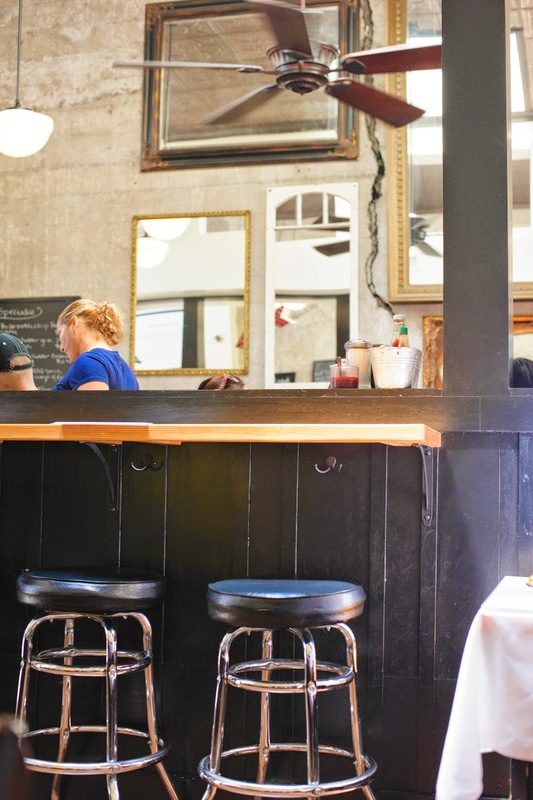 Brenda’s French Soul Food is a cute restaurant in the occasionally dodgy Tenderloin neighborhood, where Chef Brenda Buenviaje brought her New Orleans culture and cooking to share with San Francisco. We came for the beignets, but left with the intention of trying the shrimp and goat-cheese omelet or cornmeal-fried oyster po’boy. I’m a sucker for seafood and deep frying, so I think I could do some real damage here. This place gets packed. 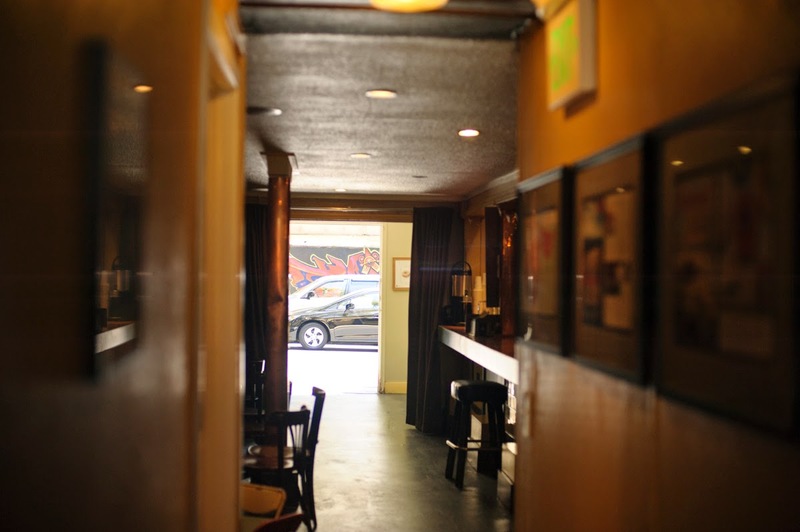 Lines out the door, and extra cozy dining rooms. This is a good sign, right? 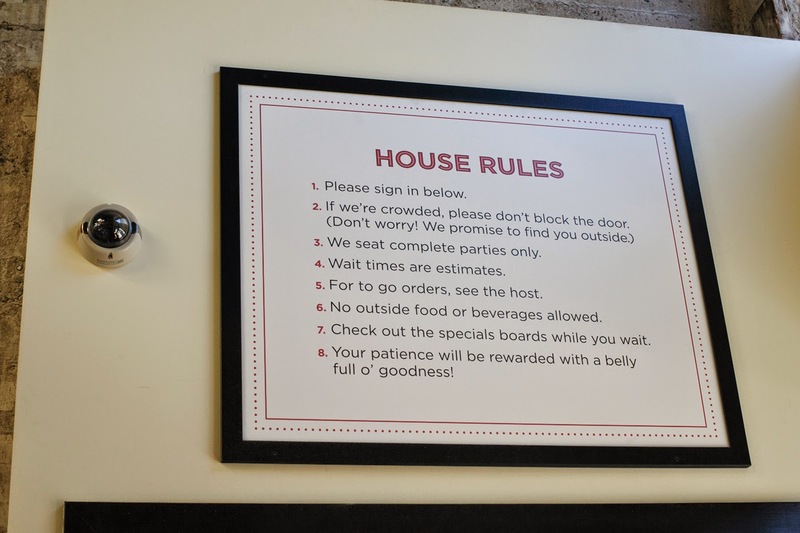 So is this one: “house rules”. They need a whole frame – I’m in. And luckily, literally. The 2pm Friday crowd was minimal, and my roommie Megan and I were seated within 5 minutes of entering. 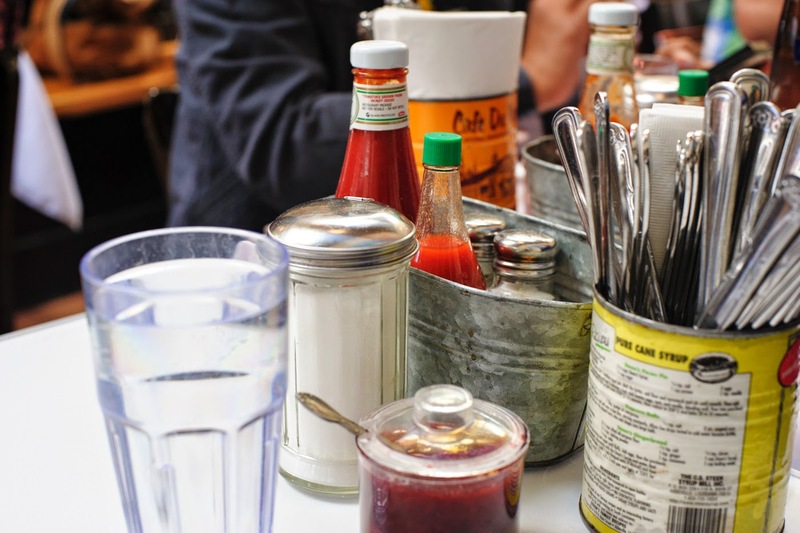 Check out the silverware cans and condiment buckets. True southern feel? I would think so, but I’ve yet to make it to Louisiana. What I do know is that some of these cans came from the famous Café du Monde in New Orleans. Authentic! Casual yet classy. Check out the mirrors on that wall. Check out the wall. 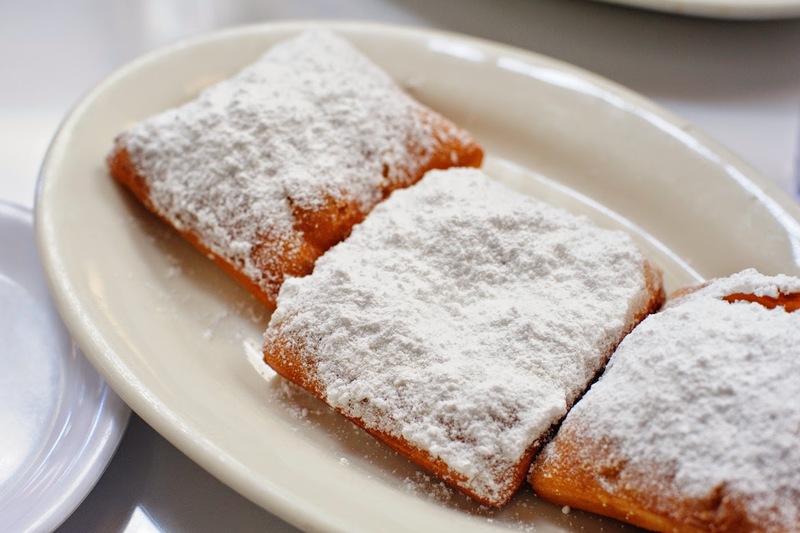 So beignets. Megan and I were kinda in over our heads here…after some consideration, we went for a plate of traditional beignets, and a plate of Ghirardelli-stuffed beignets to split. Three beignets of each, three beignets each to consume. Totally doable, right? Maybe, but the real question is always “should it be”, isn’t it? We could barely move after enjoying the dense fried dough mounds and dark chocolate chip pockets, doused in powdered sugar. 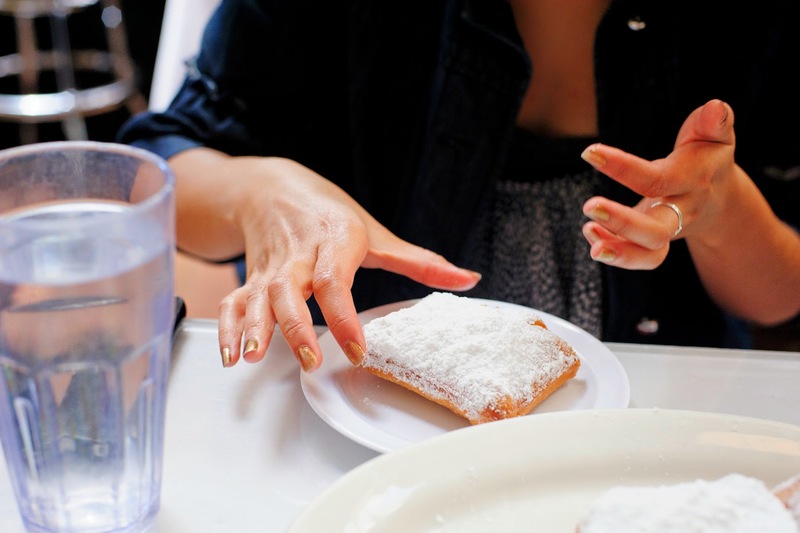 What exactly is a beignet, though? 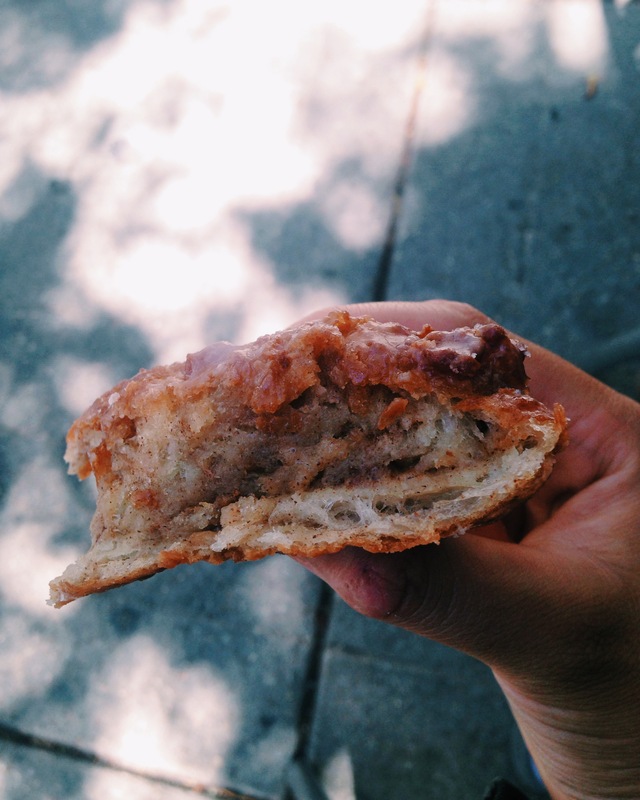 You could call it the French version of a doughnut, but for us, it’s closer to a “fritter”. 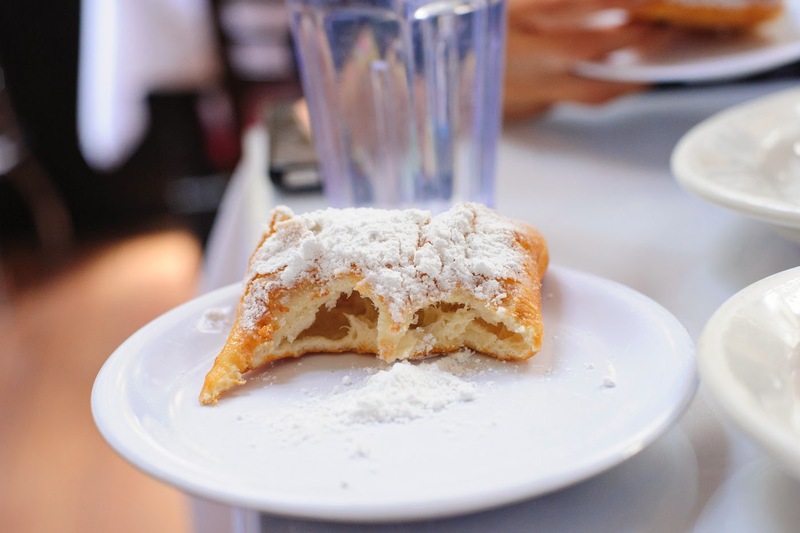 I call it a ball or square of fried dough, that is always be covered in powdered sugar in this country. 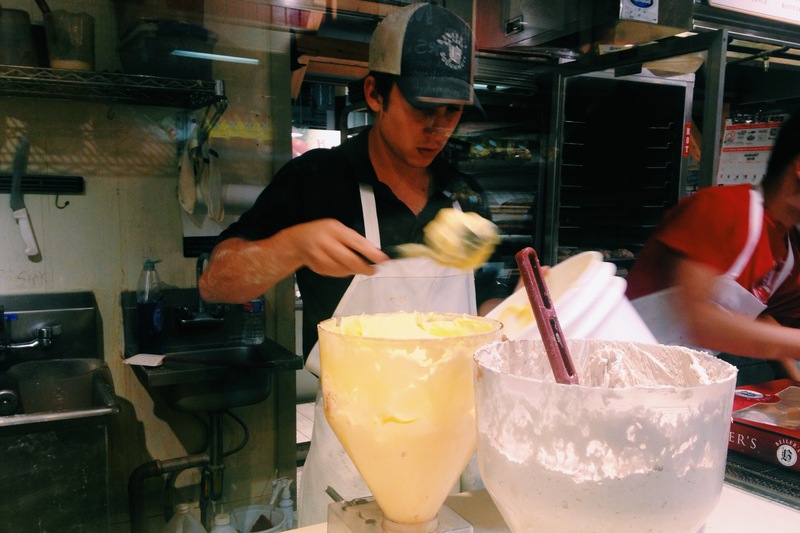 What may make it particular is the dough itself. The “choux” pastry is light and has butter, egg, and flour. 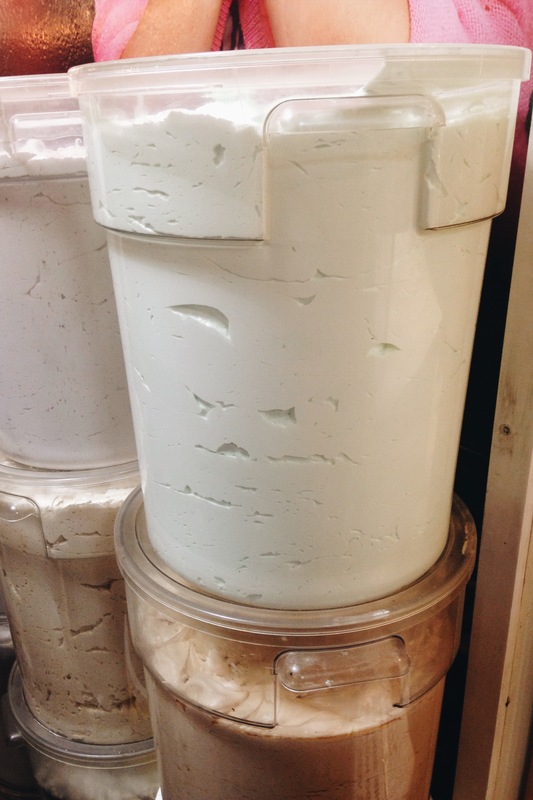 Without yeast, these treats expand when steam is created from all the moisture and heat. In this traditional beignet, you can see the pocket of air. 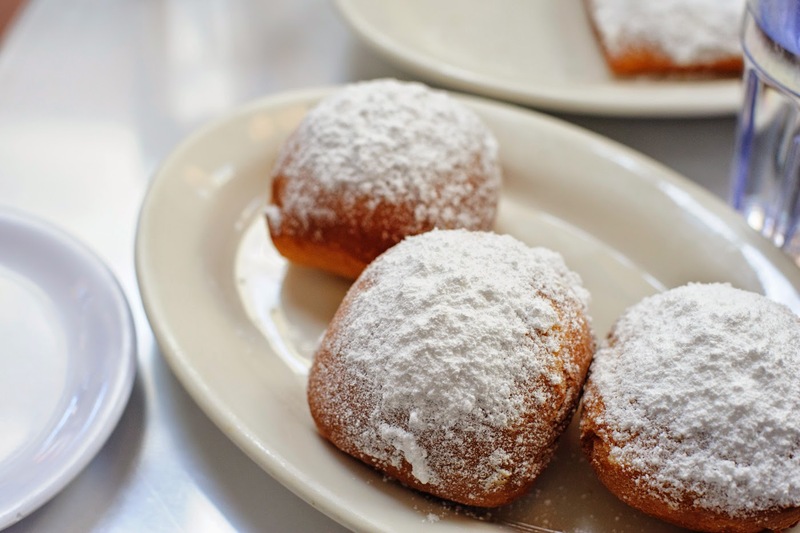 But don’t be deceived: these beignets pack a heavy punch. After one, you’re trying to calculate how you will finish the other two waiting on your plate. 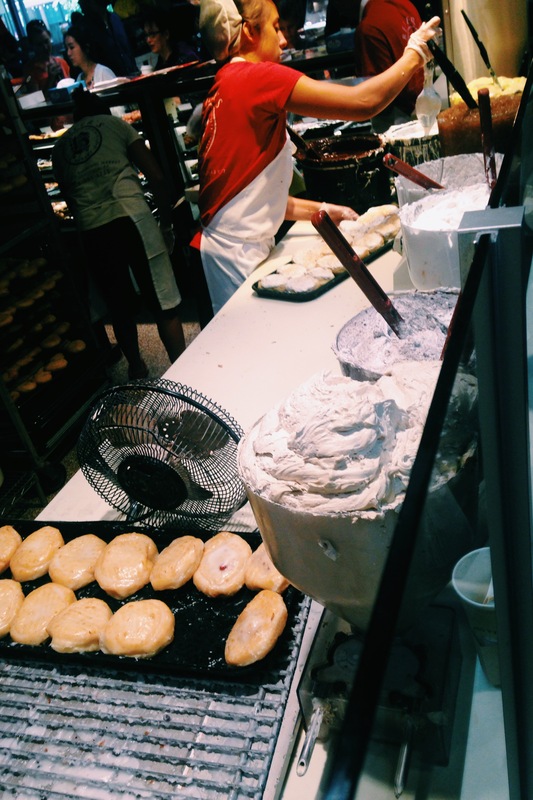 So much beignet…so little room. 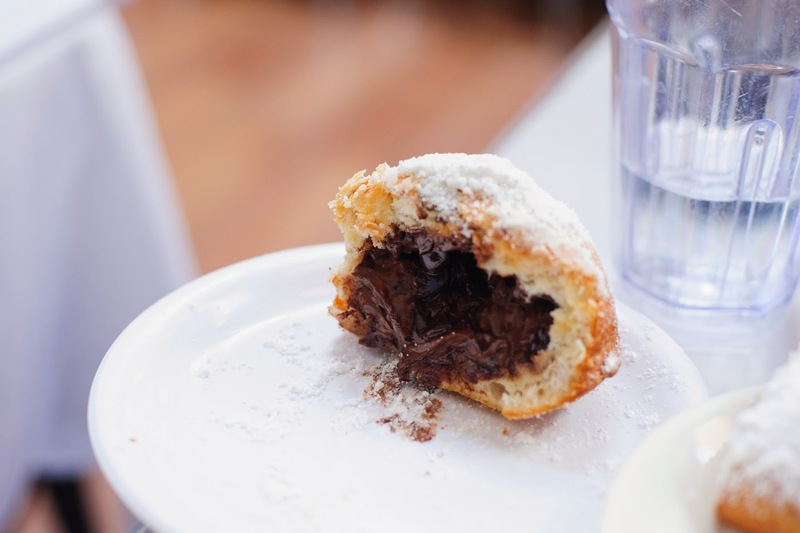 Here we have a lovely chocolate-stuffed beignet, where the middle is made up of Ghirardelli chocolate chips. Did I mention Ghirardelli originated in San Francisco? And this thing was chock-FULL. We instantly reevaluated our choice to order two plates among consuming our first one of these. I may have preferred shooting it than eating it – you really need to enlarge these images to get the full experience. The chocolate chips hadn’t even melted fully…there IS such a thing as too much chocolate, and I think we were in sight of a limit at Brenda’s. In any case, it was an excellent experience and I have no regrets. Only next time, I’ll be trying at least one of their different varieties: Granny Smith Apple (with honey butter!!) and Crawfish. A la prochaine, Brenda! One morning I was inspired to google “best doughnuts in San Francisco”, and what it came up with was less than disappointing. Among the 2-3 different sites and opinions I received, Dynamo Donuts was a unanimous choice among doughnut eaters. 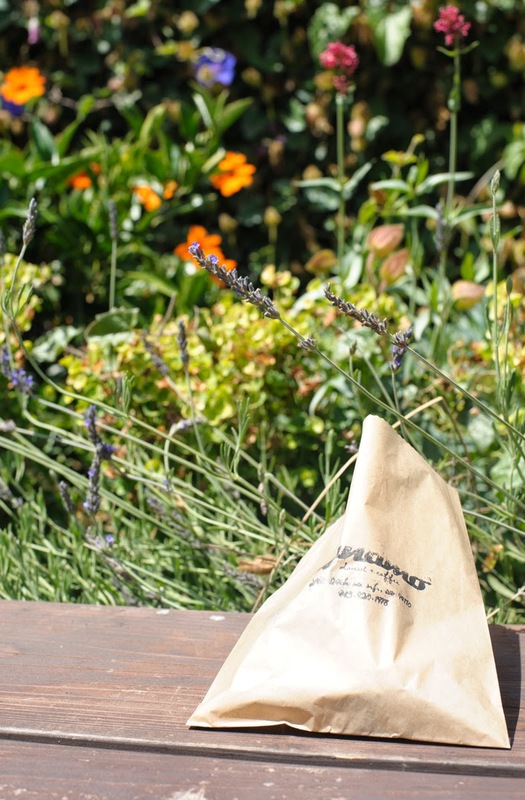 They’re known for their wacky flavors and ingredient combinations. And of course, their prices are just as hipster as their options (apparently hipsters have money now? Completely different subject). Normally these rings go for $2 each or more, but past a certain time in the day, they present their “twofer” deal where they’ll give you two, so they can get rid of as many fresh doughnuts as possible. So you can go in the morning, where they’ll have probably around 10 flavors for $2+ each, or you can go in the afternoon, when they’ll have 4 flavors for half the price. I say it’s a win-win. That’s what was left around maybe 3pm? Minus one, because I took the last of it. I picked lemon sichuan because I love all things lemony, and the cashier suggested something like “hibiscus heart beet”. I’d hoped he knew what he was talking about. I guess he did know. I was pleasantly surprised by the pink cake of the doughnut that could only have come from the ingredients. It was a nice combination of chocolate and natural sweeteners – again, from the ingredients, and not too much sugar. It was nice and simple. Particularly good for those who prefer their desserts less sweet. Then came my lemon. I’ve yet to ever go wrong with lemon. My favorite part about this doughnut was how it was “filled”. Instead of taking a whole doughnut and piping it, at Dynamo they form doughnuts halves and then place ample filling in between before frying away. GENIUS. Look at that space. No crowding of room, no cream oozing out of your bite and onto your shirt before you can get to it. The flavor was just as good: I guess the powder was supposed to be spicy, like a sort of pepper. So, definitely a healthier route than powdered sugar. But it was a very mild sourness, nothing too extreme. On the inside was the perfect lemon curd: not too sweet, and not overpowered by sour. Brought me back to my British jam days…mm lemon curd! Dynamo itself is a cool place. 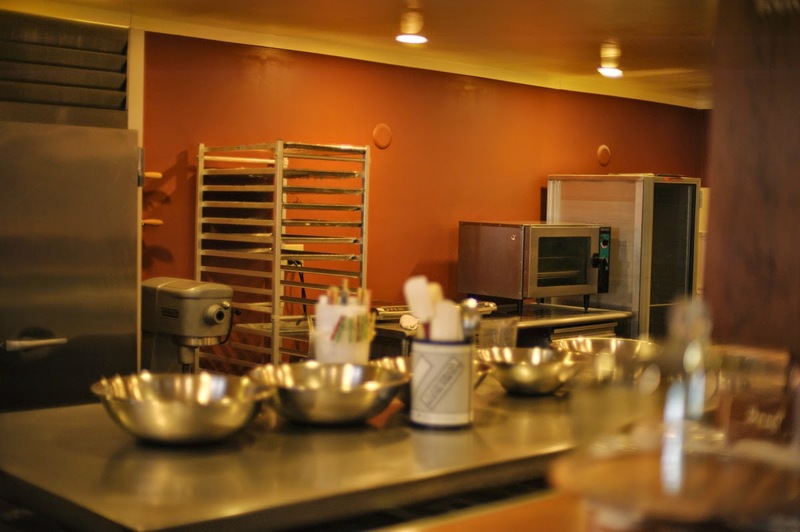 I’m finding that so many places in San Francisco where baking goes down, the kitchen is in plain view for all to see. Of course, not much happens in the afternoon…at all. But here’s where the magic happens. On the other side of the counter are chairs and places to sit and enjoy your high end coffee and doughnuts. In the back there’s a nice outdoor patio area where I hid. There you have it! 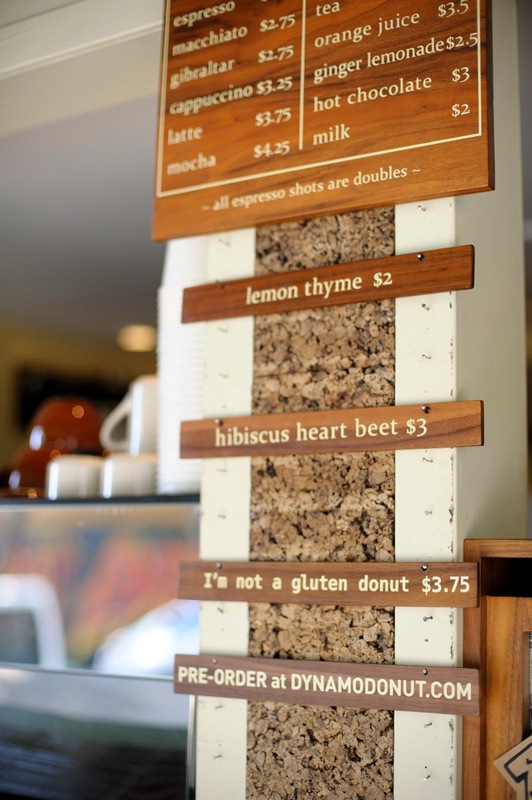 Hipster doughnuts in the hipster part of town: Dynamo Donut + Coffee in Mission. If you’re in the area, definitely check them out!